The Chicago Bulls continue to fight despite all of the drama surrounding them. Here’s how you can watch them battle again, this time against the Houston Rockets. 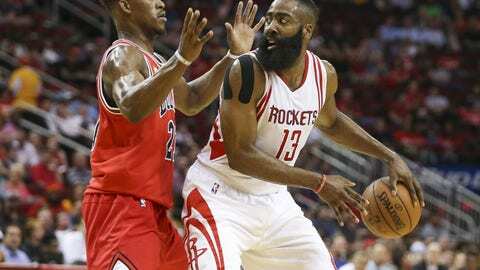 The road trip for Chicago continues, as the Bulls will head down to Houston tonight to face off against the Rockets. The storylines might be a little different than what we would have thought a week ago: For Chicago, they are coming off a dominating win in Oklahoma City after shooting 60 percent from the field, and for the Rockets, they’re staying home after a tough loss to the Atlanta Hawks. Either way, despite the reverse storyline, the Rockets are clear favorites over Chicago to win tonight’s game. The Rockets currently sit in third place in the Western Conference with a 36-17 record, and when James Harden is cooking (which is pretty much all the time), they’re an extremely tough team to beat. That being said, the Bulls managed to slow down one 2017 MVP candidate on Wednesday against Russell Westbrook. So theoretically, if the Bulls can slow down the other one, they have a great shot at winning the game. The problem with that statement? That applies every time, and around 36 of those NBA games have had teams with the same game plan fail to execute. The Bulls still play in eight more games before the All-Star break, where they’ll receive a nice eight days off. Other than Butler, who’ll be starting in the big game, no Bulls players are participating during the break. Enjoy these last few games while you can, because once we come back from All-Star Weekend, the Bulls could be a completely new team heading in a completely new direction.